The little side-wheeler - she had been built in Glasgow in 1892, and done duty as a Bosporus ferry-boat until the war began - was supposed to sail at four, but night shut down and she still lay at the wharf in Stamboul. We contrived to get some black bread, hard-boiled eggs, oranges, and helva from one of the little hole-in-the-wall shops near by, watched Pera and its ascending roofs turn to puiple, and the purple to gray and black, until Constantinople was but a string of lights across Galata Bridge, and a lamp here and there on the hills. Then, toward midnight, with lights doused and life-belts strung along the rail - for English submarines were in the Marmora - we churned quietly round the comer of Stamboul and into the cool sea. 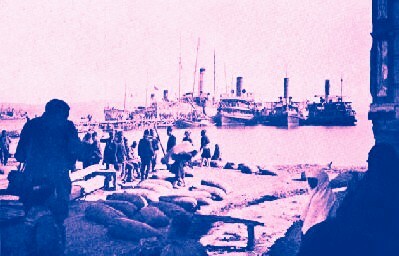 The side-wheeler was bound for the Dardanelles with provisions for the army - bread in bags, big ham- pers of green beans, and cigarettes - and among them we were admitted by grace of the minister of war, and papers covered with seals and Turkish characters, which neither of us could read. We tried to curl up on top of the beans (for the Marmora is cold at night, and the beans still held some of the warmth of the fields), but in the end took to blankets and the bare decks. It is the air the gods and heroes used to breathe; they fought and played, indeed, over these very waters and wind-swept hills. Leander swam the Dardanelles close to where the Irresistible and Bouvet were sunk; the wind that blew in our faces that morning was the same that rippled the drapery of the Winged Victory. As we went chunking southward with our beans and cigarettes, we could see the snows of Olympus - the Mysian Olympus, at any rate, if not the one where Jove, the cloud-compelling, used to live, and white-armed Juno, and Pallas, Blue- Eyed Maid. If only our passports had taken us to Troy we could have looked down the plains of Ilium to the English and French ships, and Australian and French colonials fighting up the hillside across the bay. We got tea from the galley, and -with bread and helva (an insinuating combination of sugar and oil of sesame, which tastes of peanuts and is at once a candy and a sort of substitute for butter or meat) made out a breakfast. The Marmora narrowed, we passed Gallipoli on the European side, ... and on into the Dardanelles proper and the zone of war. It was some forty miles down this salt-water river (four miles wide at its widest, and between the forts of Chanak Kale and Kilid Bahr, near its lower end, a fraction over a mile) from the Marmora gateway to the Aegean. On the left were Lapsaki and the green hills of Asia, cultivated to their very tops; on the right Europe and the brown hills of the peninsula, now filled with guns and horses and men. Over there, up that narrow strip of Europe, running down between the Dardanelles and the Aegean, the Allies had been trying for weeks to force their way to Constantinople. They had begun in February, you will recall, when they bombarded the forts at the outer entrance to the Dardanelles - Sedd ul Bahron the European side, at the tip of the peninsula, and Kum Kale, across the bay on the Asiatic shore.. These forts occupy somewhat the relation to Constantinople that Sandy Hook does to New York, although much farther away - they face, that is to say, the open sea, and the guns of the fleet, heavier than those of the old forts, could stand off at a safe distance and demolish them. Pleasantly unaware of what might as well have happened to the bread and beans, we drew up to a hill-side speckled with lights, a wharf, and a hospital boat smelling of iodoform, through a cabin window of which a doctor was peacefully eating dinner. Boxes and sacks were piled near the wharf, and from over behind the hills, with startling nearness, came the nervous Crack . . . crack . . . crack-crack-crack! 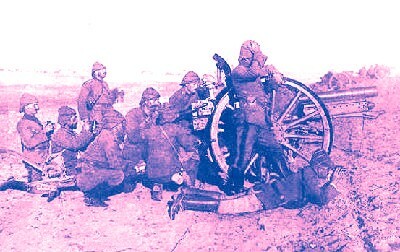 of rifle and machine-gun fire. We went to sleep to the tune of it, moved a few miles down the coast in the night, and crawled out into a world of dusty brown - brown hillsides and camels and soldiers and sacks of wheat piled on the flat, immersed in an amber dawn. This was the destination of the side-wheeler, and by sunup we were loaded into a mah6ne with a horse, several goats, three or four passengers, and four barefooted boatmen, who pushed us over the strait to Chanak Kale. We were now at the narrowest part of the Dardanelles, behind us, on the European side, the old round tower of Kilid Bahr and Medjidie Fort, in front Fort Hamidie, and on the horizon to the south, where the strait opened into the sea, the tiny silhouettes of several of the Allies' ships. Chanak was smashed like the towns in west Belgium, and, but for the garrison and the Turkish and German commandants tucked away in the trees, all but deserted, except by flies and half- starved cats. These unhappy creatures, left behind in the flight, were everywhere, and in front of the bake shop they crowded in literal scores - gaunt, mangy, clawed and battered from constant fights. It was hot, there was little to eat, and after hours of wrangling it appeared that our precious scratches of Turkish took us to the Gallipoli instead of the Asiatic side. The two were under different jurisdictions; though the fault was not ours, the local commandant had the right to ship us back to Constantinople, and after a sort of delirium of flies, cats, gendarmes, muggy heat, and debates, night descended to find us going to sleep in the middle of a vegetable farm, in a house lately inhabited by whirling dervishes, with two lynx-eyed police- men in gray lamb's-wool caps seated at the gate. By them we were marched next day to the wharf and suddenly there translated into the upper ether by the German admiral and his thoughtful aid, who, on their way to the headquarters of the land forces across the strait, whirled us over in style in a torpedo-boat. 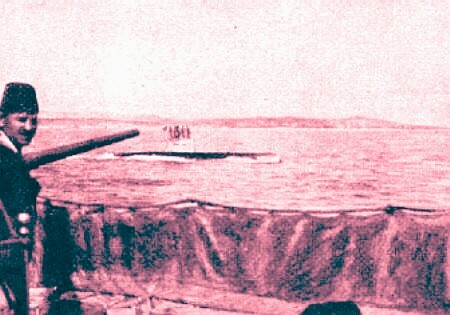 The admiral and his aid were greeted by a smart young German officer with a monocle, and galloped off into the hills, while we fell into the hospitable hands of another German, a civilian volunteer in red fez and the blue and brass buttons of the merchant marine, cast here by the chance of war. He was a Hamburg-American captain, lately sailing between Buenos Aires and Hamburg, and before that on an Atlas Line boat between the Caribbean and New York. He talked English and seemed more than half American, indeed, and when he spoke of the old Chelsea Hotel, just across the street from the Y. M. C. A. gymnasium in which I had played hand- ball, we were almost back in Twenty-third Street. He took us up to his tent on the hill, overlooking the men and stores, and, he explained, reasonably safe from the aeroplanes which flew over several times a day. Over his cigarettes and tea and bottled beer we talked of war and the world.
" Where's it going to end ? " he demanded. "There's seven hundred good men gone, maybe - how many did the Triumph carry ? And we think it's good news! If a man should invent something that would kill a hundred thousand men at once, he'd be a great man. . . . Now, what is that ? " 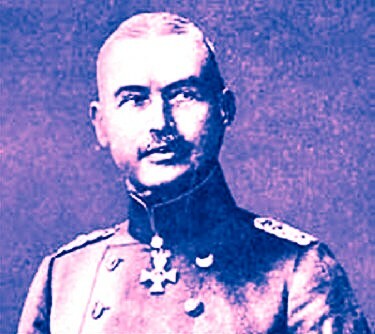 It was our first duty to present ourselves to the commandant of the peninsular forces, Field- Marshal Liman von Sanders - Liman Pasha, as he is generally called in Turkey - and the captain found a carriage, presently, and sent us away with a soldier guard. Our carriage was a talika, one of those little gondola-like covered wagons common in the country. There is a seat for the driver; the occupants lie on the floor and adjust themselves as best they can to the bumpings of the hilly roads. The country reminded one of parts of our own West - brown hills, with sparse pines and scrub- oaks, meadows ablaze with scarlet poppies, and over all blue sky, sunshine, and the breeze from the near-by sea. We passed camel trains, mule trains, horses, and tents masked with brush. Here evidently were the men we had seen marching day after day through the Constantinople streets - marching away to war in the silent Eastern fashion, without a waving handkerchief, a girl to say good-by to, or a cheer. Here they were and yet here they weren't, for the brush and tangled hills swallowed them up as thoroughly as armies are swallowed up in the villages of Belgium and France. 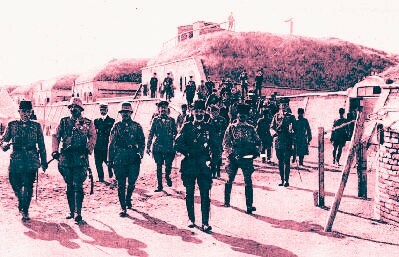 This was the headquarters of the Fifth Army, and this the commander-in-chief. A bird-man might have flown over the neighborhood a dozen times without guessing that they were there. We were hidden in the pines, and only an occasional far-off Br-r-rum-m! from the cannons in the south broke the stillness. Some one had brought up a cask of native claret from Chanak, and the field- marshal's staff were helping to put it into the bank in front of the arbor. A professor of chemistry - until the war called him back to the colors - was shovelling and showing the Turkish soldiers how the cask should be slanted; another of the superintendents had lived for ten years in America, and was enthusiastic over the charms and future of Davenport, Iowa. Presently tea came, and thin little sandwiches and cigars, and over these the commander-in-chief spoke with complete cheerfulness of the general situation. The English and French could not force the Dardanelles; no more could they advance on land, and now that the submarines had arrived, the fleet, which had been bothersome, would be taken care of. He spoke with becoming sorrow of the behavior of Italy, and did not mar this charming little fete champetre with any remarks about American shipments of arms. The ex-banker from Davenport also spoke of the Italians, and with a rather disconcerting vigor, considering that they were recent allies. The young aide-de-camp whom we had seen at the wharf declared that the Turkish soldier was the best in the world. It was a very different army from that which had been defeated in the Balkan War, and the endurance and tenacity of the individual soldier were beyond anything he had ever seen. A man would see a dozen of his comrades killed alongside him by a high-explosive shell and only shrug his shoulders and. say that now, at any rate, they were all in paradise. Westerners have heard so long of the Sick Man of Europe and his imminent decease that they are likely to associate political with physical weakness, and think that the pale, brooding, official type, familiar in photographs, is the every-day Turk. As a matter of fact, the every-day Turk is tough-bodied and tough-spirited, used to hard living and hard work. The soldiers you see swinging up Pera Hill or in from a practice march, dust-covered and sweating, and sending out through the dusty cedars a wailing sort of chant as they come - these are as splendid-looking fellows as you will see in any army in Europe. It was dark when our wagon lurched into this camp, and a full hour passed before the baffled Turks could convince themselves that our pass and we were all that they should be, and put us into a tent. Nevertheless, an orderly poked his head in good-naturedly enough at seven next morning with tea and goat's cheese and brown bread, and our captain host, a rather wildish- looking young man from the Asiatic interior, came to say he had telephoned for permission to take us to the heights above Kaba Tepe and Ari Burnu. 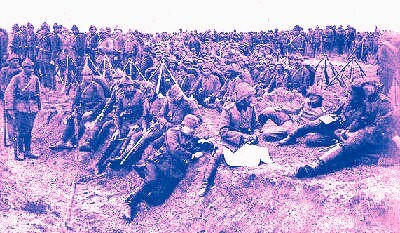 Directly in front of the English trenches were the first-line Turkish trenches, in some places not more than fifteen or twenty feet away, so close, indeed, that when there was fighting they must have fought with revolvers, hand-grenades, shovels, anything they could lay their hands on. At the moment it was quiet but for the constant Crack . . . crack-crack! of snipers. With the periscope we worked from Kaba Tepe on the left clear across the ground in front of us to the north. Over in the west, by hazy Imbros, were five or six ships; there was another fleet in the north to- ward the Gulf of Saros, and little black beetles of destroyers crawled here and there across the blue sea floor. The major took us into his tent for cigarettes and another thimbleful of the coffee. He, too, had been educated in Germany, spoke German and French, and with his quick, bright eyes and soft smile, would easily have passed for a Frenchman or Italian. This was about midway in the peninsula, and, facing south from the summit, we looked down over the twisting hills, pockmarked with holes from shells and aeroplane bombs, to the Marmora on the left, and on the right to the Aegean and hazy Imbros, and, in front, almost to the end of the peninsula. 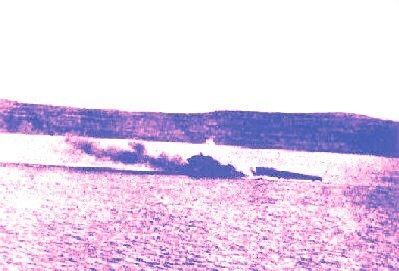 The sun was down in the west, and in its track a cruiser steamed a mile or two out from the coast, while from under Ari Burnu, where we had been that morning, a transport put out, rather recklessly it seemed, and went straight across the open water. From the south and west there was the continual Br-r-umr-m . . . br-r-um-m! of big guns, and over Kaba Tepe way we could see shells bursting. We sat there for an hour or so, waiting for one of the little specks out on the blue sea floor to fire or sink, and then, as nothing happened, returned to camp. I sat outside watching the moon rise and listening to the distant Crack . . . crack-crack! of rifle and machine-gun fire from over Ari Bumu way. Evidently they were fighting in the trenches we had seen that morning. The orderly who had served us, withdrawn a little way, was standing like a statue in the dusk, hands folded in front of him, saying his last prayer of the evening. Beyond, from a bush-covered tent, came the jingle of a telephone and 'the singsong voice of the young Turkish operator relaying messages in German - "Ja ! ... Ja ! ... Kaba Tepe ... Ousedom Pasha . . . Morgen frith . . . Hier Multepe! . . . Ja! . . . Ja!" Thanks to indefatigable period magazine collector and contributor Tony Langley for both the text and and images used in this article. or to Mike Iavarone regarding form and function.